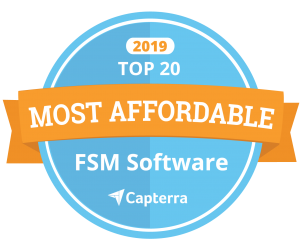 Snappii is happy to announce that is named in Capterra’s Top 20 Most Affordable Field Service Management Software. Capterra is a leading online resource for business software buyers. It features validated user reviews and independent research across hundreds of software categories. Snappii has already listed #13 in Capterra’s Top 20 Most Popular Construction Management Software List. And now we offer mobile apps to help plumbers, electricians, HVAC, elevator, vehicle specialists and various inspectors save time, cut costs, increase efficiency, accelerate activities, improve management and boost the revenue. Snappii apps for field service management can become a perfect pocket assistant and allow users to better organize working process, track time spent on a job, improve documentation and reporting, and stay on time and on budget. Job Estimate and Repair Order mobile app is a perfect pocket tool to provide detailed information about projects and work completed by service organizations. It keeps track of basic data, specific details of the job and its progress statuses by creating estimates to completion reports. Users are able to calculate total cost in labor, parts, and the grand totals of the estimates and reports, inform and agree upon the changes made to the project sync collected data across multiple devices, work online/offline and more. This app will be a perfect assistant in the field. Anyone can create daily log reports right in the field with Field Service Daily Log app. Users are able to fill in all necessary details including specific contact details, locations, add and mark up photos, signatures and more. Moreover, Field Service Daily Log app is a powerful reporting tool, which help employees instantly create reports on mobile devices and send them to managers. It is the integral tool for accurate and efficient management. Moreover, Snappii provide specific apps for particular occupations and activities. For example, Estimate Plumbing app, HVAC Inspection Checklist app, Cleaning Inspection Checklist with Tasks app, etc. All these field service apps are available for free download from Apple and Google Play Stores and can be 100% customized to meet specific needs of any organization. Snappii is the only software provider that enables companies utilize their existing Forms and PDFs and quickly convert them to mobile forms to add to any Mobile App or use them separately. This accelerates conversion of paper to digital format and significantly reduces the cost of going paperless. Field service industry actively masters the use of mobile solutions. Thanks to modern field service management software, modern companies have real-time, everywhere communication, fast and convenient work with current data and optimized workflow and customer service. Snappii is proud to be a part of this and listed in the Top 20 Most Affordable Field Service Management Software. We continue our development in this field and welcome all businesses to join Snappii and try our solutions. This entry was posted in Blog and tagged Mobile forms, business mobile app, field service, mobile app development, software by Alex Bakman. Bookmark the permalink.